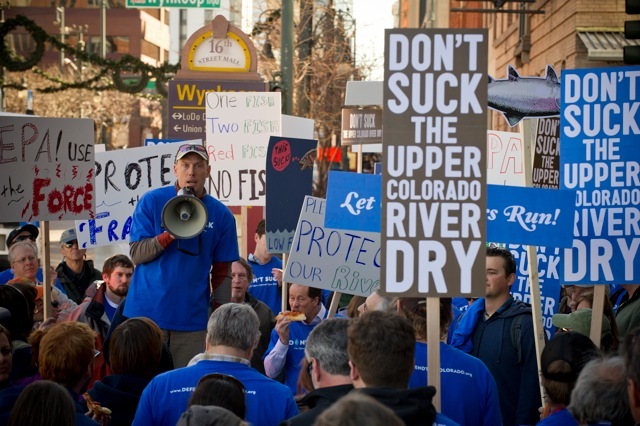 More than 100 river advocates holding signs and chanting slogans gathered in front of the Environmental Protection Agency building in downtown Denver Thursday to ask federal regulators to protect the Upper Colorado River system from proposed water diversions to the Front Range. 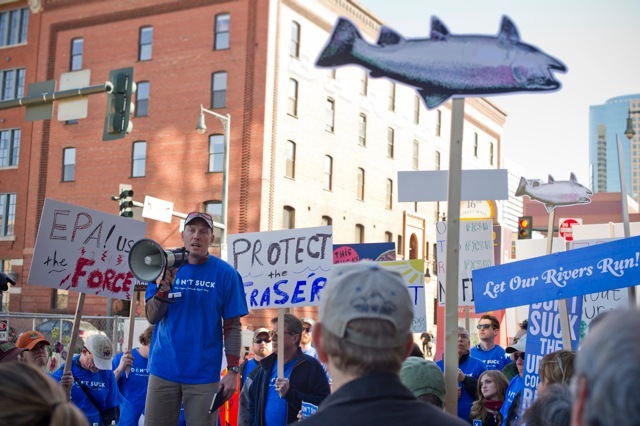 The rally is part of an ongoing campaign to protect the Upper Colorado River and its tributary, the Fraser River, and the mountain communities, businesses, people and wildlife that depend on them. The Denver rally, say organizers, was meant to show EPA and other federal decision-makers that Denver residents care about the state’s outdoor quality of life and the health of rivers. The Defend theColoradocoalition is asking EPA–which Eberle called a “partner” on river protection–to take additional steps to ensure the health of the river in the face of two proposed water diversions. Already 60 percent of the Upper Colorado is diverted to supply Front Range water users. The Windy Gap Firming Project proposal, along with a separate Moffat Tunnel water project, could divert as much as 80 percent of the Upper Colorado’s natural flows. The current proposed Windy Gap protections from the Bureau of Reclamation fall short of what’s needed to address mounting problems, such as low flows, rising temperatures, spreading algae and smothering sediment. As Eberle told the lunchtime crowd, a state study released earlier this year shows that entire populations of native fish and the insects they feed on have virtually disappeared from the Colorado Riverbelow the Windy Gap Reservoir due to past diversions. “Is this what we want to see happen to our rivers?” Eberle asked. Field and Stream magazine editor-at-large and MidCurrent columnist Kirk Deeter, a Colorado resident, said he was lucky enough to travel the world in his job but always looks forward to coming home to his home state and home waters. He called the Upper Coloradoa ”special place” that deserves protection. Also speaking was Jon Kahn, owner of Confluence Kayaks in Denver, who stressed the economic impact of water-based recreation, which he noted contributes “hundreds of millions of dollars” annually to the state’s economy. “I am just one of hundreds of business owners whose livelihoods depend on healthy flows in our rivers,” he said. Ensuring healthy flushing flows to prevent river habitat from filling in with silt. Bypassing the Windy Gap dam to reconnect Colorado Riverand restore river quality. The group is planning additional rallies and events this spring to highlight the plight of the rivers and demand action from state and federal decision-makers. The Defend the Colorado coalition includes Colorado Trout Unlimited and a range of stakeholders, including conservation and wildlife groups, landowners, and outdoor recreationists. More than 400 western slope businesses have signed a petition asking state leaders to protect the Upper Colorado. For more information, go to www.DefendTheColorado.org. Thanks to Trout Unlimited and Colorado Trout Unlimited for providing coverage of the event. Opponents to Christo: "Don't Hang the Curtains Yet"